In a flash, your fishing line tightens. You set the hook, your rod dips and the fight is on. Within seconds, there's a flash of green and a bass leaps out of the water. Whether you're out to hook bass from the end of a dock or a tournament angler looking for a new challenge, bass are abundant in Minnesota. You'll find surprisingly nice-sized fish that compare favorably to states farther south in just about any area of Minnesota – both in big lakes and small, out-of-the-way haunts. From canoeing in remote Boundary Waters Canoe Area Wilderness to power-boating across our north central lakes to finding the right eddies and pools in a number of rivers, Minnesota makes it easy to find a great day of bass fishing. Bass anglers are at home in Minnesota, where fishing is bigger than Paul Bunyan. Big or small, popular or off-the-radar, there's no need to choose just one. 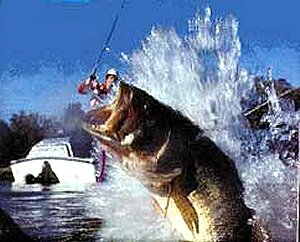 You'll find excellent bass fishing north, south, east and west. More than 2,000 Minnesota lakes support self-sustaining largemouth bass populations. More than 500 support smallmouth bass. And don't forget rivers like the Mississippi, St. Croix, Red Lake, Zumbro and Cloquet. Spring and fall are good times to fish the shallows for bass, while deeper water is better during summer heat. Weedlines and structure such as logs, tree branches dipping into the water and boulders are excellent spots to try. In Minnesota, the fishing's always on, but be prepared for any type of weather, from heat to snow depending on the season. Many anglers find that using strong rods with heavy line helps to quickly reel in bass that might otherwise get tangled in aquatic plants. As for bait, live and artificial both work. Next to panfish, bass can be the next easiest fish to catch, but catching them consistently takes skill and knowledge. Bass are a great sportfish. They can be good eating but many anglers are out there to relax and enjoy nature, for a sense of accomplishment, and to share the good times with others. Anglers can fish for smallmouth and largemouth bass starting each year on same day as the walleye and northern pike fishing opener. 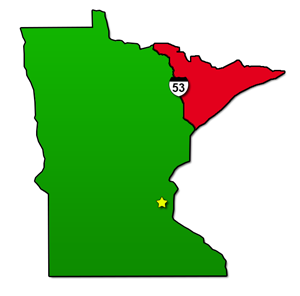 On that day, an early bass harvest season opens north and east of U.S. Highway 53 from Duluth to International Falls (red area), and in the rest of the state (green area) there is a catch-and-release bass season that runs from the regular harvest season until late May. In the fall, smallmouth bass fishing is catch-and-release only in most of the state (green area). For more details on seasons and special regulations for individual waters, see Fish Minnesota. Lake Minnetonka – The lake's name comes from the Dakota expression meaning great water. Great bass fishing abounds in this metropolitan area lake's many connected bays. Mille Lacs Lake – Two hours north of the Twin Cities, you'll find Minnesota's second largest lake. Walleye made it famous but trophy smallmouth abound. Leech Lake – Shallow, heavy cover and tough braided line are the keys to largemouth in the many bays of this north central Minnesota lake. Rainy Lake – Fish smallmouth in the darker water in the south arm early and the clearer water in the north arm late. Mississippi River – Try almost any pool along the Minnesota-Wisconsin border. Farther upriver, look for deep eddies and any kind of structure, and you'll likely find a smallie. Green Lake – Look for rocks scattered along the sandy shorelines of this western Minnesota lake. Fish those dark spots for lurking smallmouth. Lake Vermilion – Smallmouth aren't a surprise in this lake on the edge of the BWCAW, where smallmouth were first introduced in the late 1800s. But don't be surprised with a largemouth on the end of your line. A number of Minnesota communities host bass fishing tournaments. Learn by seeing the pros up close or testing your skills as a competitor. The expandable map on the right shows all the lakes where bass have been found during fish population surveys. Select a lake below for details. Check here first for answers to your fishing regulation questions. Get the latest fishing regulations on your phone. Search for lake specific information including regulations, fish species, stocking reports, lake maps. Search for lake specific information including regulations, fish species, stocking reports, lake maps.